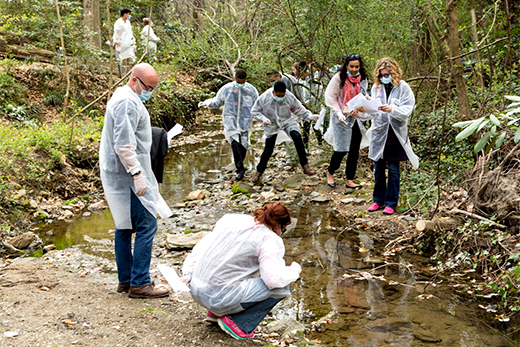 Participants in the Zombie Outbreak Game scoured Peavine Creek on the Emory campus in 2016 for clues to the cause of a mock epidemic. The popular game returns this year on Sunday, March 19. Watch for an astronaut, zombies, a hovercraft and liquid nitrogen ice cream to pop up on the Emory campus during the Atlanta Science Festival, March 14 to March 25. Thousands of science enthusiasts, of all ages, are also expected to appear for the fourth annual event – which includes lab tours, talks, a planetarium show, movie screenings, science-themed dance and games and lots more interactive fun. The festival blasts off at Emory this year with a talk by NASA astronaut Mark Kelly. Tickets are going fast in the countdown to the event, set for 7 p.m. on Tuesday, March 14, at Glenn Memorial Auditorium. The title of Kelly’s talk is “Endeavor to Succeed.” He will give an insider’s perspective on space travel and the year-long NASA experiment he is participating in with his twin brother, also an astronaut, on how space affects the human body. The public is also invited to enter a contest to name the festival's new astronaut mascot. Entries are due by Friday, March 10, at 5 p.m., and the winner will receive four VIP tickets to Kelly's talk.